Saturday, September 28 1907 -- The Gans-Memsic fight came off yesterday, and Joe, much as expected, came out on top. 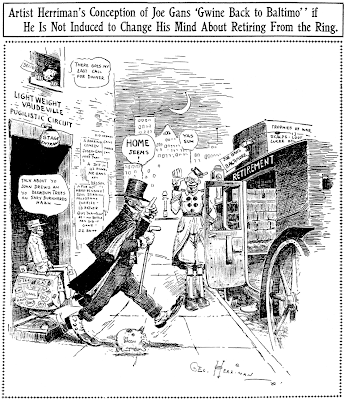 Herriman's cartoon comments on Gans' talk of retirement after this fight, but looking into the 'future past' Gans wouldn't hang up his gloves for another two years. There's a post title that Rene Magritte might like. But this really isn't a new post. What it is, though, is a signpost beckoning you to go down below, a mere few inches below this one, where it says Obscurities of the Day: Comics of DBR Media in attractive san serif bold type. The response to this post has been so wonderfully informative that I've had to expand on and rewrite large swaths to take into account new information. New features and new samples have been added. Go on down and have a look. But what about the story of Diane, Brad, and Richard? We're going to knock off a whole syndicate company in one post today! DBR Media was formed in early 2000 by a group of folks who had previously been at the helm of the King Features Weekly Service. I could tell you a lot about the interesting circumstances behind this based on an interview I did with David Cohea, the current head honcho of KFS Weekly, but that will have to wait for another time and place. I have an extensive audio interview with this gentleman that's been in the can for over six months now, but so far I lack the free time to transcribe it for publication. Anyhow, suffice to say that DBR Media was formed by some folks with plenty of savvy about syndication to weekly newspapers. With the Al Smith Service going out of business in the 1990s, and the Chicago Tribune's weekly syndication arm seemingly determined to keep themselves a very well-kept secret, KFS Weekly was pretty much the only game in town for weekly newspapers. With a client list of well over a thousand newspaper subscribers they had a reasonably lucrative business going despite the penny ante fees they charge. The folks who formed DBR felt that they could compete for a slice of that market. When I learned about DBR Media back in 2001 I called their office and explained that I was a researcher seeking to keep track of their offerings. I asked for the name of a paper that I could subscribe to that ran the material. The person I talked to was skeptical at first; I think she figured me for a spy, maybe from King Features. I repeatedly assured her that my motives were entirely innocent, and she seemed to warm up just a little. Eventually with a little more prodding she gave me the names of four publications but warned me that DBR doesn't keep track of how much of their offering these publications actually run. I told her I understood and that I'd call them to make sure before subscribing. The names of the publications were themselves a bit of a letdown. Two of the four were obviously company newsletters, not newspapers by any stretch. These I discarded. That left me with two publications, and both of them sounded like "Pennysaver" type papers. Those papers don't normally qualify for the attentions of Stripper's Guide, but I figured that the main thing was to document the material appearing somewhere and that as time went on perhaps I'd find them in a qualified paper. I called the business office of the first paper on the list and explained that I wanted to subscribe if they ran the DBR comic strips in their paper. The person I talked to wanted to be helpful but she had no clue what DBR Media was and assured me that their paper ran no comics. For that matter there was essentially no editorial matter at all -- it was purely an ad paper. She even asked around the office and no one seemed to have heard of DBR. By the end of our conversation she was asking me for DBR's phone number so she could call them and find out if they were paying for something they weren't using! I called the second paper, a black weekly, and was gratified that they'd at least heard of DBR Media. However, I was told that they used only one feature (I don't recall what it was) and that they were already planning to discontinue it to save the expense of the subscription. The person I talked to was glad that I'd called because it reminded her to call DBR to cancel their subscription, a job that she'd been putting off. Oh great, turns out I may as well have been a corporate spy. Despite my completely innocent purpose I was losing papers for DBR! Of course now I would be persona non grata at DBR so there was no point in calling back asking for more papers to try. In the following years I always kept an eye peeled for DBR features, checking every weekly paper I came across. It wasn't until late 2006 that I finally hit paydirt with the Lake Region Times, a weekly published in Madison Lake Minnesota. They published DBR's complete roster of comic strips. I purchased a subscription and was finally able to track DBR's output. Unfortunately the party lasted only a year as DBR closed it's doors in early 2008. This well-drawn, innocuous 'boy and his dog' strip was originally with King Features Weekly and, according to an article in Editor & Publisher, switched over to DBR a year after they started up. Howell's strip seems to have been one of the first original strips distributed by KFS Weekly and probably started there circa 1990. A consistently attractive strip, sort of Walt Disney meets William F. Marriner, with mild gags designed never to offend the mayonnaise on Wonder Bread crowd. Szorady has made a long career out of his anthropomorphic dog strip, George. It originally ran in his college paper, Ohio State University's Lantern, circa 1979. It was picked up by King Features Weekly in 1990 when they added original comics, and switched, along with Butch and Dougie, to DBR when they opened their doors. When DBR closed down Szorady fell back on self-syndication, marketing George through a company called, appropriately enough, Georgetoons. George the dog, along with his apparently unnamed wormy companions, generally act out run-of-the-mill gags occasionally punctuated with a jarring liberal-bashing example like the one shown here. A new creation for DBR, Stormfield ran from the beginning of their syndication business. Alex Stormfield stars with a supporting cast of his classmates. Alex is a smart-aleck and a proto-slacker, obsessed with girls despite his apparent pre-teen age. Consistently strong personality-driven gags make this feature a cut above the rest, and a surprising amount of snarkiness, unusual for a strip designed for rural papers, keeps things lively. Charles Brubaker breaks the bad news the Wes Alexander died right about the time DBR did, and that Stormfield was run in reprints in the final months. Here's a web page about Alexander. This feature was one of the original DBR offerings. In July 2003 Steier decided to discontinue the strip because it was a simple case of too much work for too little pay. From what I can tell based on the samples at Steier's website, it started out with a premise exactly defined by the title but then went quite far afield in some interesting directions. Steier did double-duty as DBR came out of the gate, providing Suzy Q Toy Repair along with The Dinosaur Circus. Another excellent strip, this one is about a girl who repairs toys for various bratty kids. Another original premise very well-executed. For some reason DBR put the kibosh on this one after about a year and asked Steier to replace it with The Block (see below). A heapin' helpin' of Suzy Q can be found here on Steier's website. Iwent there just to snag a sample and ended up reading every strip. Fun stuff. In Steier's own words, "after DBR canned Suzy Q, they asked me to do a black strip. As a white suburban woman, I told them this would be no problem at all". The Block was what more racially diverse strips ought to be -- a funny feature about people who just happen to be some other hue than the Bumsteads, the Flagstons, the Mitchells, the Worths, the Starrs, the Parkers, etc. etc. etc. Very funny stuff, archived in quantity here at Steier's site. Based on the samples there, it looks like the strip ran circa May 2001 - June 2003. An odd but often fun strip this one. Our cast is made up of a group of hamsters, a cat, and a rabbit, all of whom live together in relative peace except when the cat gets a hankering for a hamster sandwich. The characters are aware that they are in a comic strip, and many of the gags break the fourth wall. Polly Keener also betrays an avid interest in quilting with her occasional gags on the subject. Hamster Alley is now distributed by Georgetoons. As usual, I'm at a disadvantage not having been able to keep up with DBR's output, but my guess is that The Leftersons was the replacement for The Dinosaur Circus in mid-2003. It's a comic strip about schoolkids designed to appeal to political conservatives (a viewpoint that apparently plays big in weekly papers). It's liberal-bashing gags have the rather rare property of actually being funny. More than can be said for most such strips, like the consistently nasty and unfunny Mallard Fillmore. Based on a reading of Hayes' website, The Leftersons actually started in 2002, presumably web-based at the time, and new episodes were added at a clip of three per week. Hayes stopped producing the strip in April 2007 but it continued to run from DBR until the bitter end. Whether DBR ran reprints of strips they'd already used, or used the extras Hayes had produced earlier is unknown. In order to balance the conservative viewpoint of The Leftersons DBR added Jet News around 2004. Bill Murray is a veteran cartoonist who has spent most of his time under the mainstream radar producing strips for black papers. As his first major foray into mainstream syndication Jet News is a really odd misfire. Although at first glance it looks like a comic strip, it is actually a pair of editorial cartoons, usually on unrelated subjects, grafted together to no good effect. I suspect that Murray just took his editorial cartoons that he produced for other papers and pasted them together to create Jet News. Bill Murray added a second feature to the DBR line-up in 2005, this one at least an actual comic strip. The Golden Years features a senior citizen duo usually known simply as Gramps and Granny, along with a pair of snotty grandkids and assorted other foils. Predictably, gags about doctor visits, retirement and the rotten younger generation abound. Night Lights and Pillow Fights, a vertical activity feature for Sunday comics pages, began in 1998 first in self-syndication, then was picked up by Copley News Service in May 2001. It then switched from Copley to DBR on May 4 2003. My impression is that Night Lights and Pillow Fights was distributed separately to holdover clients because DBR wasn't really set up for distributing features for Sunday comics sections. In 2006, Your Angels Speak (see below) became a sort of sub-feature in the page and it was renamed Night Lights and Fairy Flights. After DBR's demise, Night Lights went back to its self-syndicated roots until Gilchrist called it quits with the episode of September 6 2009. Around 2004 Gilchrist brought his religious-themed panel Your Angels Speak to DBR after a short two year run at United Feature Syndicate. In 2006 the theme of the feature was incorporated as part of the Night Lights and Pillow Fights feature and this panel was dropped. Your Angels Speakwas a gorgeously-drawn feature, not infrequently featuring 'babe angels' that make it darn hard to think pious thoughts. Probably the last addition to DBR's line-up was the cow-centric strip Marvin the Calf. It came along sometime in 2005. The delightfully spare fine-line cartooning, reminiscent of the wonderful style of Mark Tonra, got your hopes up only to have them dashed by a tin ear for gag writing. Early strips of Marvin the Calf are, and I cannot put a better face on this, truly awful. If gags could be tortured, Marvin was Torquemada. By 2007, though, Hagen was getting the hang of the writing part of his gig. His dialogue was smoother, he could construct a coherent gag, and he even elicited the occasional chuckle. DBR closing was probably a blessing to him. 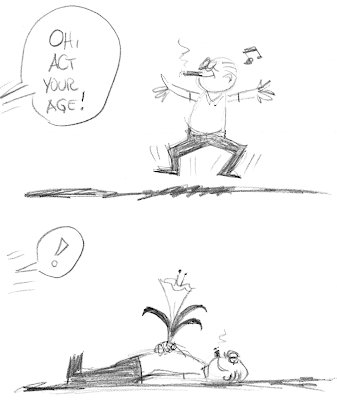 Having now hit his stride as a cartoonist, he promptly went out and got a big-time syndicate contract at Creators Syndicate for his new strip, The Barn. What is with this guy and farm animals? DBR Media closed its doors in March 2008, issuing statements that they were no longer able to pay their contributors. Apparently the Lake Region Times had a premonition that DBR was sinking and jumped ship in January (switching to -- what else -- King Features Weekly Service), so I didn't get to see the last few months of their material. Charles Brubaker tells me that the last strips ran in papers dated the week of March 24 2008. So that's my brain dump on DBR Media. Obviously my informations is fragmentary, so anyone who has additional information on the syndicate and their features is cordially begged to fill me in on the details I missed or just got wrong entirely. Since this post took the better part of a whole day to put together, I'm going to have to call a recess for the rest of the week while I continue to attend to pressing business. Might want to note that "Hamster Alley" became part of the Georgetoons lineup and continues to this day. Ralph Hagen ended up starting another comic strip featuring a cow called "The Barn" with Creators Syndicate. "Stormfield" actually ended months earlier, with DBR filling it in with reruns until its demise. In a dark twist, the same week DBR announced it would close shop, Wes Alexander passed away. I produced 4 cartoon panels per week for DBR for the entire run of the company and was paid well and on time, up until the end. When they went out of business, I heard from several weeklies who wanted to keep using my work, buying directly from me. I have no behind the scenes dirt on DBR, but they were always a good client for me and I miss working with them. Thanks very much for the additional details! Don't happen to know if the Georgetoons stuff has any traditional newspaper clients, do you? Sorry to hear about Wes Alexander, he was one of the brighter lights in their line-up. Sorry to have left you off the roster. Were your DBR panels a continuing titled feature or more like spot cartoons? Unfortunately the Lake Region Times didn't run them so I was in the dark. Makes me wonder what other comic features DBR might have had in their line-up that I haven't seen. By the way, love your style! I know of one paper in California that also had the DBR package. After they went under the said paper continued to run new "George" and "Hamster Alley" through the new "syndicate". I'll have to get back to you re: the name of the paper, but it's out there. While I have Your Angel Speaks debuting from United, I have NL&PF starting with Copley. It switched over to DBR beginning May 1, 2003 according to my notes (but that's a Thursday). Retitled Night Lights and Fairy Flights on October 15, 2006. When DBR shut down Gilchrist went the self-syndication route (Gilchrist Features) until earlier this year when he ceased creating the feature. Guy announced that the last one was September 6, 2009. That California paper Charles is thinking of is the Dixon Independent Voice. The Leftersons apparently ended on April 12, 2007 and those running later are reprints. in the archives of Hayes Leftersons site. I definitely agree that Mallard Fillmore is as "unfunny" as they come, but "hate"? You are definitely drinking the kool-aid on that one, my friend. A different point of view does not make it hate. If it is hate, rack up every editorial cartoon and strips from Doonesbury to Edison Lee in the hate category as well. I'm not willing to do that. Hi Allan - A package of DBR strips used to run in the Acorn newspapers in Southern California. They were free weeklies for Thousand Oaks, Simi Valley, Moorpark, Camarillo (http://www.theacornonline.com/). My memory is that they ran 4 strips and a couple of the puzzle features which took up a 1/2 page of their tabloid format. The Simi Valley Acorn dropped them a couple of years ago. A lot of comments to respond to, but Pere Francois' comment deserves an answer first. When I used the term 'hate' I meant it as 'nasty' or 'vitriolic'. With all the talk about 'hate crimes' the term hate is a loaded term these days, and I shouldn't have used it. I didn't mean that Mallard Fillmore was necessarily racist or misognystic. I've changed the post. Re The Leftersons, I went to the website and see where you get your end date. However, in reading some other material there and looking over the archives Hayes was doing three strips a week up until the end of 2004 (for other venues) so it could be that DBR had quite a big backlog to work from and the remaining year was 'new' to DBR subscribers. It would take some pretty heavy-duty cross-referencing to figure it all out. Maybe Hayes will weigh in? Thanks for catching that error on "Night Lights". I was reading from the wrong listing in my database! Post has been updated. Go to Google Advanced Search. Select filetype "pdf" and search for the phrase "dbr media". Many interesting links show up, which are relevant to this post. I was the creator of The Leftersons...and your suppositions are correct. Toward the end, I was supplying reprints to DBR - some of which were only published online. For a brief period, I created the strip on a daily basis (and had a few daily papers as clients, such as the Salt Lake Tribune, Bremerton Herald, a paper in Idaho and one in Colorado Springs, along with a couple others), but it proved to be far too much work, along with my regular job as a freelance illustrator, so I backed off. DBR was unfortunately unable to pay us (or me, anyway) the last few months, but I continued supplying strips until the end. I was glad to be a part of their stable for a few years. Thanks for the review! I think the Boston Herald might have run Guy and Brad Gilchrist's Night Lights and Pillow Fights on Sundays in the 2000's, I think it was also the only paper I know that carried Guy and Brad's "Mudpie" comic strip in the daily Boston Herald comics (I think I remember seeing it in the Boston Herald - It was even carrying the 1974 Peanuts reruns - while on a New England cruise in October 2000). Sorry to have been gone for a week. I've been working my tail off, both at my 'real' job and finishing up material for the Stripper's Guide book. By the way, still no definite title -- publisher is currently pulling hard for one that includes the word 'encyclopedia' -- I'm against the idea because it's not what I think of as an encyclopedia. Besides, that term has been used at least three times before in our genre. I think it will create confusion with book buyers -- "hey, this must just be a new edition of one of those old books". There's certainly one particular 'encyclopedia' I don't want people to confuse me with, if you know what I mean. Last week I spent all my non-work hours gathering together the images for the book. Would you believe that the final image count is over 3000, representing over 2300 separate titles? And that's after having to very reluctantly dump most of the material I scanned back in the 1990s. Back then with 640 x 480 displays those scans looked just fine, but with today's higher resolution monitors many of them looked more like postage stamps than comic strips. Yeah, I know, comics today ARE the size of postage stamps, but try showing a classic era Sunday at that size. Yuck. I probably rejected at least 500 images, a process that was just as depressing as it sounds. Luckily I've gotten much smarter about archiving my scans since those days. Here's a tip for my fellow scanners. Pretty much everything I scan these days I archive both as a screen-quality version and a print-quality 600 dpi image. The next time screen resolution takes a jump I'm safe from another process of weeding out material that's no longer up to snuff. All I'd have to do is run a Photoshop batch process to resample those high quality versions for whatever is appropriate screen resolution at the time. Tomorrow be prepared for an extravaganza -- the Stripper's Guide blog returns with eight, yes, eight, obscurities all in one post! By the way, on my computer the Stripper's Guide blog page has been REALLLY slow to load the past few weeks. Are you guys having the same problem? Hello, Allan---Here are some titles: Pretentious: COMICS--THE BOOK. Intellectual: INTERTEXTUAL ANALYSIS OF THE SEQUENTIAL IMAGE NARRATIVE. Ethnic: COMICS, BUBBELAH! Juvenile: FUNNIES R FUN! Miscellaneously awful: I'M MAKING A NOISE LIKE A COMIC STRIP HISTORY, ENCYCLO-COMICO-PEDIA AMERICANA, LITTLE IODINE AND ALL THE OTHER COMIC STRIPS, THE AMERICAN COMIC STRIP WITH NO RUBBISH ABOUT PITIFUL FOREIGN CRAP THAT COULD BE COMPLETELY MADE UP ANYWAY FOR ALL ONE COULD CARE....Cole Johnson. You made my day Cole. I think that last title may just have to go on the A-list. Y'know, I seriously considered not including Little Iodine in the listings. I love comic strips, good and bad. The good ones I enjoy, the bad ones have me pulling for them to get better. But I truly loathe Little Iodine. I'd rather eat a meal of liver and cauliflower, both of which make me retch, to reading a Little Iodine strip. The Orlando Sentinel ran that damn thing every Sunday, and every Sunday I'd read the stupid thing just so I could yell "THAT'S NOT FUNNY ... AGAIN!" to no one in particular. Why did Bob Dunn, a very funny guy, write that crap? Why did Hy Eisman, a fine cartoonist, draw it? I was certain that it was specifically created just to torture me. Thirty years later I still get the heebie-jeebies when I see red-headed little girls. And if they turn out to be precocious ... well ... let's just say the jury would be in for an entertaining trial. Honestly, there are so many strips much worse in art, storyline,and subject matter than poor little Iodine. I can't believe after all this time dealing with exceptionally obscure items from the past and present, you have this fixation on LI. It ran for so many years, spawned tons of comic books and even a film, if that's a measure of it's popularity. Perhaps the 40's ones were best, but scientifically speaking, wouldn't you say it slipped into mediocrity more than remarkable badness? Look at other strips that outlived their creator that went south- Is Iodine really worse than post-Bushmiller Nancy or post-Montana Archie? I say not! maybe a reader survey( in at least a semi-serious vein) of what the worst may be could be taken. I think few will pick on the little Tremblechin brat. Jim, I laughed out loud at this! This may be the funniest ever!